The needs for image processing and computer vision is increasing in recent years. The introduction of video element and media stream in HTML5 is very important, allowing for basic video playback and WebCam ability. But it is not powerful enough to handle complex video processing and camera application. Especially there are tons of mobile camera, photo and video editor applications show their creativity by using OpenCV etc in Android. It is a goal of this project to include the capabilities found in modern video production and camera applications as well as some of the processing, recognition and stitching tasks. This API is inspired by the WebAudio API. Unlike WebAudio API, we try to reach the goal by modifying existing Media Capture and Streams API. The idea is adding some functions to associate the Woker-based script with MediaStreamTrack. Then the script code of Worker runs image processing and/or analysis frame by frame. Since we move the most of processing work to Worker, the main thread will not be blocked. Thanks for the amazing asm.js and emscripten work, we also provide an asm.js version of OpenCV called OpenCV.js. 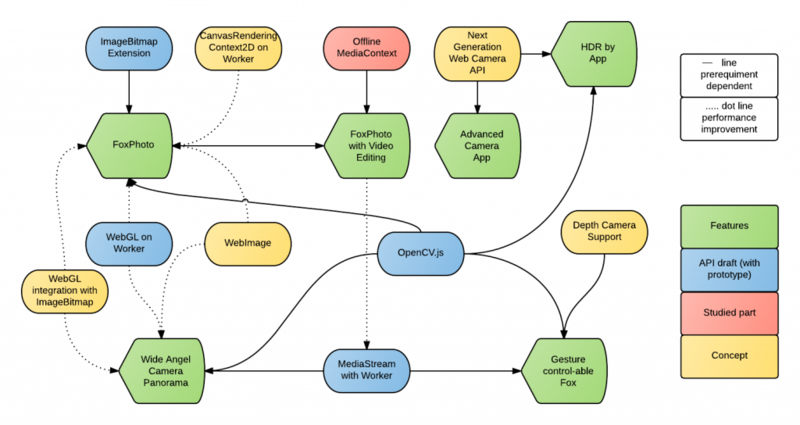 The web developers can leverage the power of OpenCV in a simpler way. The original design of this project is WebAudio like design called WebVideo. But is is deprecated due to we want to follow The Extensible Web Manifesto. We believe this kind of design is best for the Web. Take below examples to against WebVideo design.<bt> Computer vision area is more thriving than ever after deep learning introduced. We can't enumerate video nodes for all kinds of creativeness for the future. For example, suppose we enumerate all we can image in current time. But still something we can't image. Maybe we lost an area called image sentiment analysis. I take this as an example because I just known it recently. Image sentiment analysis is trying to classify the emotion from human face in image. So should we add this as a new video node? Take another extreme example, we think we would not have argument on face detection or face recognition. But what we talk now is only for human face. What if we someone think we need to detect and recognize animal face? Sounds like a ridiculous idea right? But it is a real business. A product called "Bistro: A Smart Feeder Recognizes Your Cat's Face" was on indiegogo. So should we extend the original face detection/recognition node or add a new video node for cat or ask them to implement it in VideoWorker? If we ask them to implement in VideoWorker, then we might need to re-consider are those existing video node make sense? Should we move them all into VideoWorker and implement them in JS? If yse, the WebVideo will degenerate to only source node, video worker node and detestation node. Compare to degenerated WebVideo, the MediaStream with worker design is more elegant. This project is initialized by the FxOS team which means the performance and power consumption for mobile devices are considered from day one. The new design is a simple and minimal change for current API. 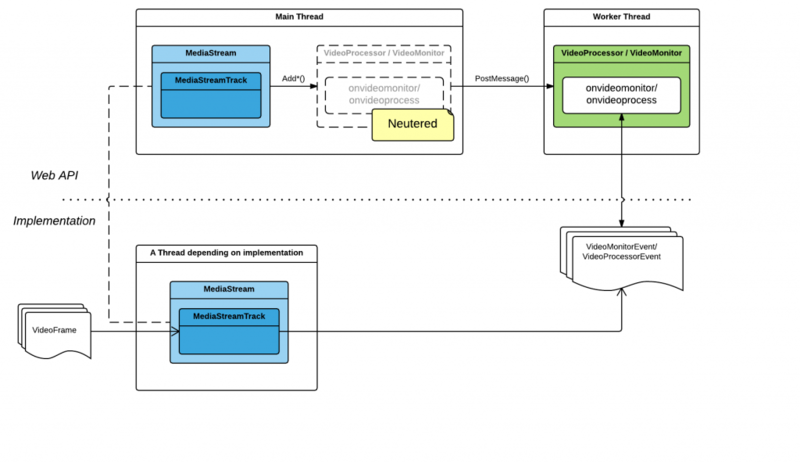 By extending MediaStreamTrack and adding Worker related API, we can let MediaStream be able to support video processing functionality through the script code in Worker. Below is the draft WebIDL codes. Please see  for the draft specification. Please check the section examples in MediaStreamTrack with worker. Please see  for more information. Why do we need WebImage? Because performance is matter to prompt computer vision to the Web. We need it for performance reason. Most image processing task can be accelerated by WebGL. But it is not the case for computer vision area. So we need a hardware accelerated-able computer vision related web API to help Web developer deliver a fast and portable Web page and application. That is the motivation of WebImage. This is a new zone needed to explore. So we might start from refer to existing related API. In end of 2014, KHRONOS released a portable, power efficient vision processing API, called OpenVX. This specification might be a good start point for WebImage. The following diagram is a brief concept of OpenVX. It is a graph-node architecture. 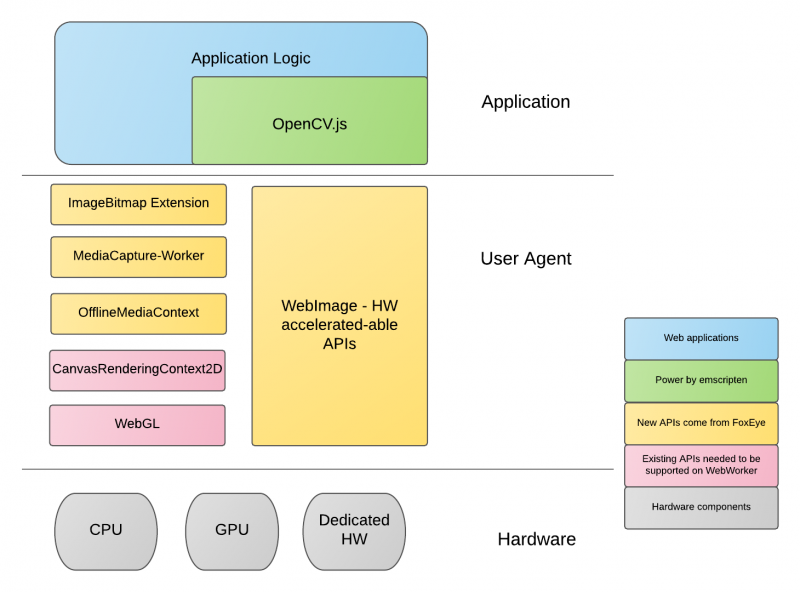 The role of OpenVX for computer vision is like the role of OpenGL for graph. The developer just construct and execute the graph to process incoming image. OpenVX can be implemented by OpenCL, OpenGL|ES with compute shader and C/C++ with SIMD. That means we can support OpenVX in wide range Web platform from PC to mobile once a OpenVX engine is provided. We introduce the “OfflineMediaContext” and modify the “MediaStream” here to enable the offline (as soon as possible) MediaStream processing. When developers are going to perform the offline MediaStream processing, they need to form a context which will hold and keep the relationship of all MediaStreams that are going to be processed together. // Add an optional argument into the constructor. OfflineMediaContext is the holdplace of all MediaStreams which are going to be processed together in a non-realtime rate. OfflineMediaContext is also the object who can trigger the non-realtime processing. 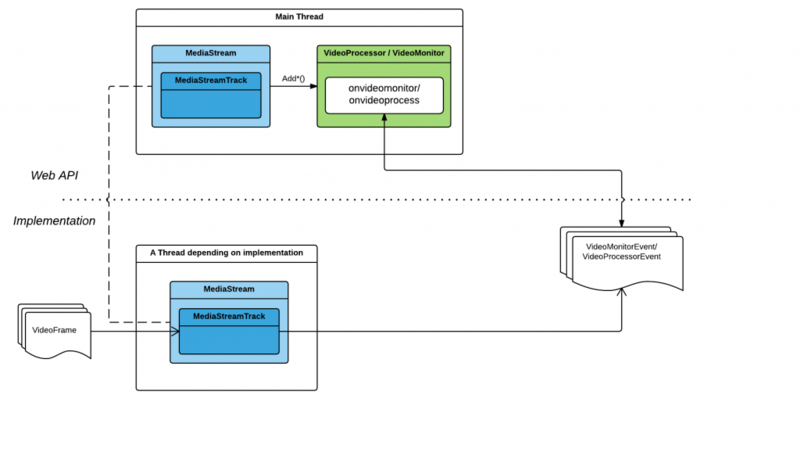 The native implementation of OfflineMediaContext holds a non-realtime MediaStreamGraph, which is just the same as the OfflineAudioContext in WebAudio specification. The constructors are modified by adding an optional parameter, OfflineMediaContext. By this way, developers are able to associate a MediaStream to an OfflineMediaContext. If the optional OfflineMediaContext is given, the native implementation of the MediaStream should be hooked to the non-realtime MSG hold by the given OfflineMediaContext in stead of the global realtime MSG. This is the technology tree of FoxEye. The solid line is the dependency. The dash line is for performance improvement. The green blocks are possible applications. The blue blocks are API draft with prototype. The red block is we know how to do but not yet starting. The yellow blocks are only the concept. Need more study. So step by step, we can provide photo manager, wide angle panorama, HDR, and even gesture control. A faster way for video editing tools. Lots of existing image effects can be used for photo and video editing. Try to land and standardize MediaStream with worker, ImageBitmap and ImageBitmap extension. see for how to process standardization in Mozilla. Start to work on OfflineMediaContext. Support product requirement, for example, Instagram-like app, wide angle panorama or Fox photo. Do some explanatory experiment on WebImage concept. Proof of Concept for WebImage. A crazy idea of Kernel.js or SPIR.js for JS developers to customize WebImage ? Gestural control API with depth camera? => WebNI(Web Nature Interaction)? Step by step, we can make thing different. FoxEye is a pioneer project trying to push the Web boundary to a new area, image processing and computer vision. The key factor to ensuring this project success is you, every Web contributor. Your supports, your promotions, your feedback, your comments are the nutrition of this project. Please share this project to every Web developers. Let's bring more and more amazing things to the Web. Let's rich and improve the whole Web platform competitiveness. This whole idea of adopting WebAudio as the reference design for this project was from a conversation between John Lin. Thanks for Robert O'Callahan's great feedback and comments. Thanks for John Lin and Chia-jung Hung's useful suggestions and ideas. Also, big thanks to my team members who help me to debug the code. My name is Chia-hung Tai. I am a senior software engineer in Mozilla Taipei office. I work on Firefox OS multimedia stuffs. Before this jobs, I have some experience in OpenCL, NLP(Nature Language Processing), Data Mining and Machine Learning. My IRC nickname is ctai. You can find me in #media, #mozilla-taiwan, and #b2g channels. Also you can reach me via email(ctai at mozilla dot com). Tzuhuo Kuo is an engineer in Mozilla Taipel office. CJ Ku is responsible for OpenCV.js part. This page was last modified on 14 December 2016, at 06:54.